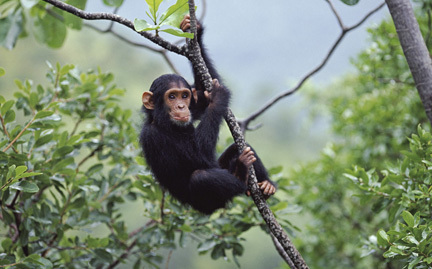 One of the most well known apes, the chimpanzee lives in the forests and savannahs of equatorial Africa. Highly intelligent, chimpanzees hunt cooperatively and use tools, such as branches and sticks, to forage for food. Once found in 25 African countries, chimpanzees are now extinct in three or four and are nearing extinction in others due to deforestation and commercial hunting for bush meat. All four subspecies of chimpanzee are endangered.